Robert Dean “Bob” Lutz, 86, went home to be with his Lord and Savior, Jesus Christ, on Tuesday, December 4, 2018. Funeral services will be held 10:30 a.m. Friday, December 7, 2018, at Blessed Hope Church in Vinton with Rev. Matt Hantz officiating. Visitation will be held from 5:00 to 7:00 p.m. Thursday, December 6, at the church, and one hour prior to services on Friday. Interment will be in Evergreen Cemetery, Vinton. Military rites will be performed by Vinton’s American Legion Post 57 and Iowa Military Funeral Honors. Bob was born March 29, 1932, on a farm between Garrison and Keystone, the son of Edward and Mary Vogeler Lutz. 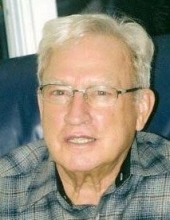 He was a 1950 graduate of Lincoln High School in Vinton. Bob proudly served his country in the United States Army during the Korean War and was a member of Geo. G. Luckey American Legion Post 57 in Vinton. On May 24, 1958, Bob was united in marriage with Carol Franklin at the Vinton Presbyterian Church. Bob farmed in the Brandon area and also worked for the Cedar Valley Times in Vinton. The church was important to Bob and his family, and he served as a Deacon before becoming a charter member of Blessed Hope Church. In his spare time, he enjoyed antiques, puttering outdoors and being helpful to others. Bob is survived by his wife of 60 years, Carol, of Vinton; son Ron (Deb) Lutz of Vinton and daughter Lisa Lutz of Brandon; a brother, Clarence A. Lutz of Lookout Mountain, GA; a sister, Elberta LeVine of Germantown, WI; one grandchild, Mikah Robert Lutz, and one step-grandchild, Tanner Speidel. He was preceded in death by his parents; brothers Marion and Merlin Lutz; and sisters Phyllis Harrison and Dorothy Schulte. Memorials may be directed to Blessed Hope Church or the Vinton American Legion Post 57. To send flowers or a remembrance gift to the family of Robert Dean Lutz, please visit our Tribute Store. "Email Address" would like to share the life celebration of Robert Dean Lutz. Click on the "link" to go to share a favorite memory or leave a condolence message for the family.